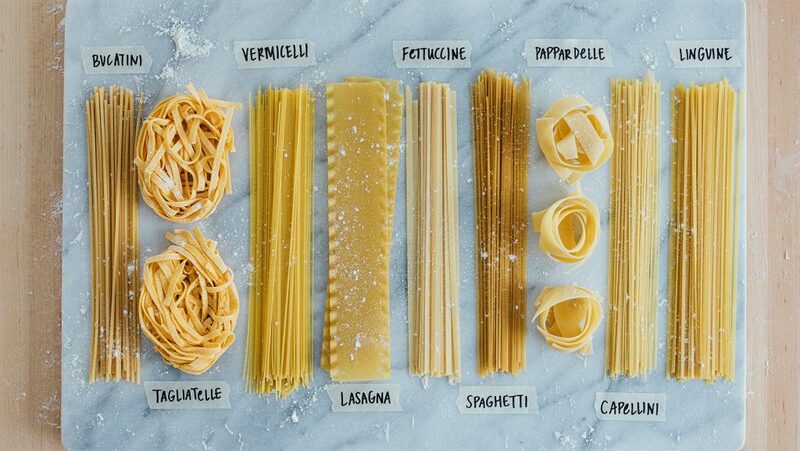 A Picture Guide to Pasta Types | What’s For Dinner? A trip down the pasta aisle can leave your head spinning. There are so many shapes, styles, and sizes. 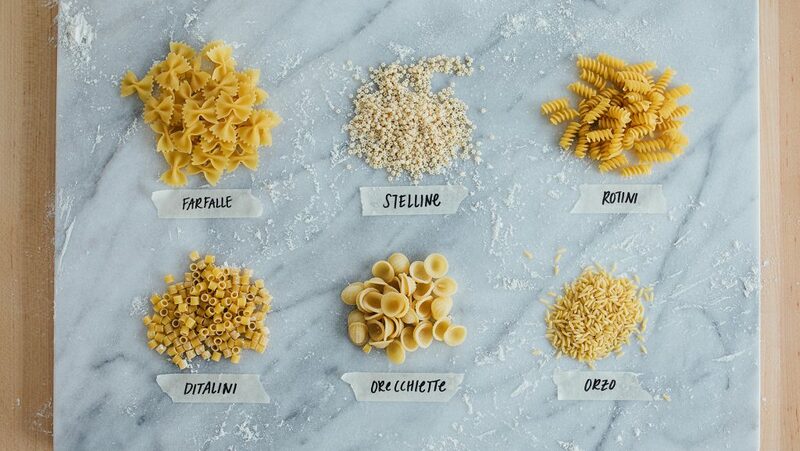 Use this easy-to-follow guide to learn which types of pasta you should use during your next pasta night. Smaller pasta shapes, interchangeably called “macaroni,” fall within the 1- to 2-inch range. They’re best served with thick, chunky sauces or baked into creamy casseroles. Their sturdy shapes also hold up well in pasta salads, though the smallest of the small are best in soups. Farfalle: Bowtie-shaped pieces named after the Italian word for “butterfly,” farfalla. Orzo: Small noodles shaped like grains of rice. These are often added to garden salads, pasta salads and soups. Ditalini: Small tube-like shapes, commonly used in pasta e fagioli. The name means “small thimbles” in Italian. Stelline: Tiny, star-shaped noodles that cook in just 5 minutes. 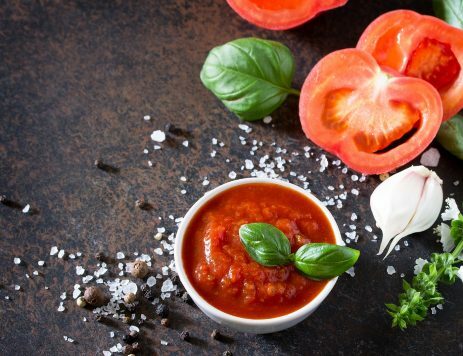 These are best used in soups, as they tend to get lost in saucy or meat-based dishes. 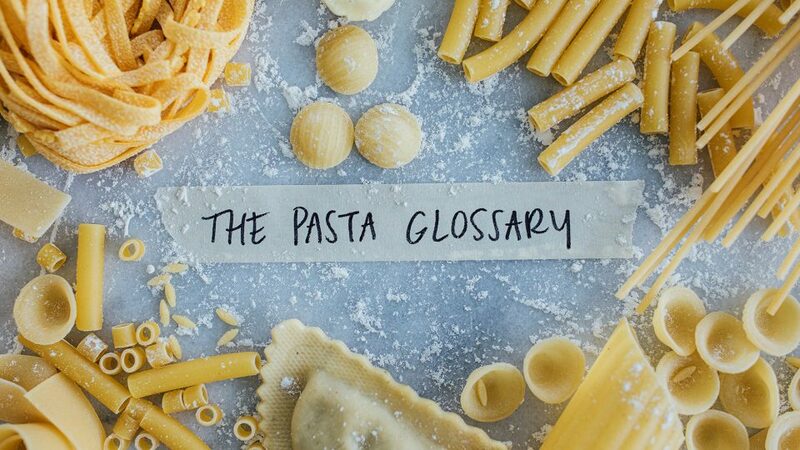 Long, ribbon-cut pastas are often lumped into the “spaghetti” category, but there are actually many variations. These noodles pair well with pesto, fresh tomato, and wine- or butter-based sauces. Spaghetti: The standard (and most popular) long noodle with a medium density. Capellini: With ultra-thin strands that measure between 0.85 and 0.92 millimeters, this pasta is delicate and falls apart if overcooked. It’s often labeled as “angel hair” pasta. Vermicelli: Traditional pasta, similar to spaghetti but slightly thicker. Translates to “little worms” in Italian. 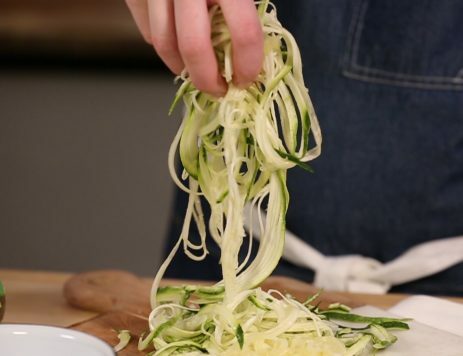 Linguine: Strands of pasta with rounded edges that are wider than spaghetti. Tagliatelle: Often made of egg-enriched dough, this medium-wide and toothsome noodle can stand up to meaty sauces. Fettuccine: Flat, thick noodles with a name meaning “little ribbons” in Italian. Pappardelle: Large, broad, flat noodles, wider than fettuccine. Often made with egg added to the dough. Bucatini: Rounded strands that look like spaghetti; however, unlike spaghetti, bucatini has a long hole running through its center. May also be called perciatelli. Lasagna: Sheets of pasta rolled out to medium thickness. Usually layered with sauce, cheese, veggies, and/or meats, while baked into a classic Italian American casserole (or simmered in soup). Tube-shaped pastas are also called “extruded pasta,” as they are made by forcing dough through a die to form various shapes. In artisan pasta-making traditions, bronze dies are used to create a coarser texture. 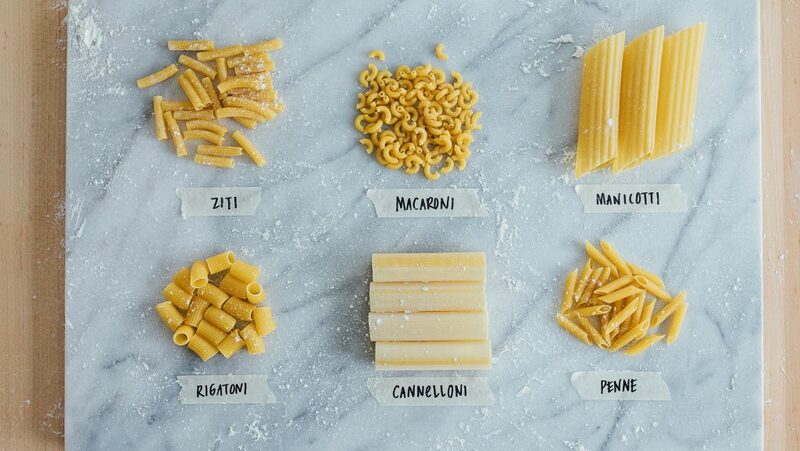 Macaroni: Technically, “macaroni” is a general word to categorize small and medium dried-pasta shapes. In America, it has become somewhat synonymous with elbow macaroni, the small curved tubes traditionally used in mac and cheese and pasta salads. Cannelloni: Smooth tubes, most often covered in sauce and baked after stuffing. Manicotti: Large tubes, similar to cannelloni but with ridges. This shape originated in Italian American cuisine and is also baked after stuffing. Ziti: Hollow, straw-shaped noodles that are smaller and narrower than rigatoni and frequently baked into saucy, cheesy casseroles. Some pastas are shaped specifically to hold other ingredients like cheese, meat, and vegetables. These types of pastas are best served in butter, cream, or tomato sauces to allow the flavorful filling to shine. 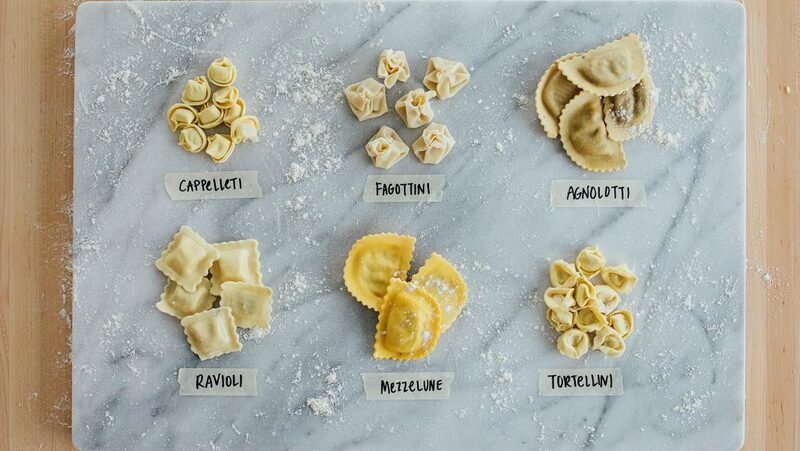 Ravioli: Two flat sheets of pasta that form a dumpling-like structure for filling (most commonly cheese). Tortellini: Little rings filled with cheese, meat, or other ingredients. Tortelloni is similar to tortellini, but is about two times larger. Cappelletti: Small, filled pasta, folded diagonally so they resemble the shape of a hat. Agnolotti: Small, crimped pillows, with fillings similar to ravioli. Fagottini: Little bundles of pasta, usually filled with vegetables like carrots, onions, and greens beans, as well as ricotta cheese. Mezzelune: Crimped semicircles stuffed with cheese and sometimes veggies or meat.